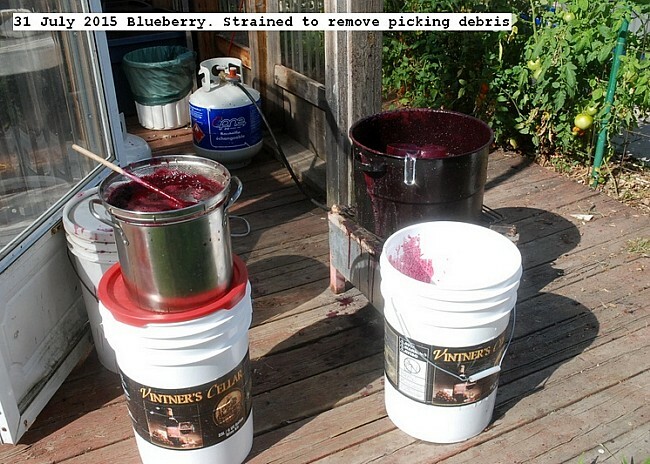 Twenty three pounds of blueberries were picked from a local farm.The berries were washed, placed in a pot and covered with water.Cooked until soft about 15 minutes then beat into a slurry with a hand blender.The juice was then strained through a typical mesh screen to remove any picking debris. There is almost no cellulose fiber in blueberries.The strained juice was placed n liter jars and pressure canned in two batches of 7 for storage. Cost was $2.25 per pound and translates to about 1.6 pounds of berries per liter of juice.Each jar of juice costs about $3.25. This entry was posted in Uncategorized and tagged Blueberry Juice. Bookmark the permalink.